This morning, take part in our excursion for both packages: Guided tour of a handcraft manufactory of gondolas and masks. We'll cruise in the Lagoon. The afternoon and evening in Venice are free to do as you please. 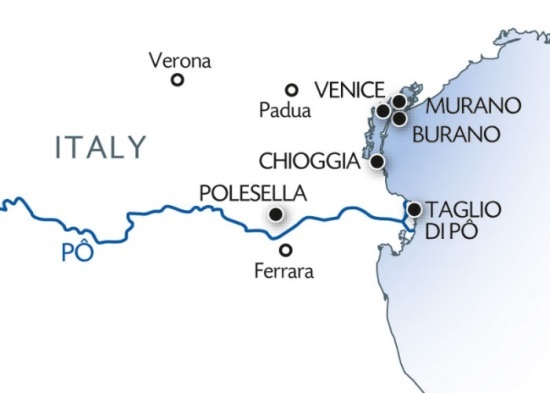 We'll cruise to Chioggia. This afternoon, join us on an excursion for both packages: Guided tour of Padua, town of St. Anthony of Padua. Revel in the special atmosphere of the Lagoon City. Follow Casanova's footsteps through the secret passageways at the Doge's Palace. Discover the captivating Lagoon islands of Murano and Burano. Tour a handcraft manufactory of gondolas and masks, Venetian symbols. Visit Padua, town of St Anthony.